With a mission to “create fresh, inventive art with musical sounds” and “promote skillful musicians and songwriters whose goal is to compose from mind, body, and soul,” The Nation of Love is an independent record label that connects passionate music makers with devout music lovers. Mr. History was the first band whose album was released under The Nation of Love’s purview, and the label has since added fellow KC band The Future Kings and Columbia artists Violet & the Undercurrents, Ruth Acuff, Zorya, Violet Vonder Haar, and Phylshawn. “I wasn’t looking for the most popular musicians,” says Johnson, “but those who would always make music because it’s their calling and love.” As a result, the label’s artist roster is an interconnected and collaborative collective of musicians that has released more than 15 albums altogether since its inception. 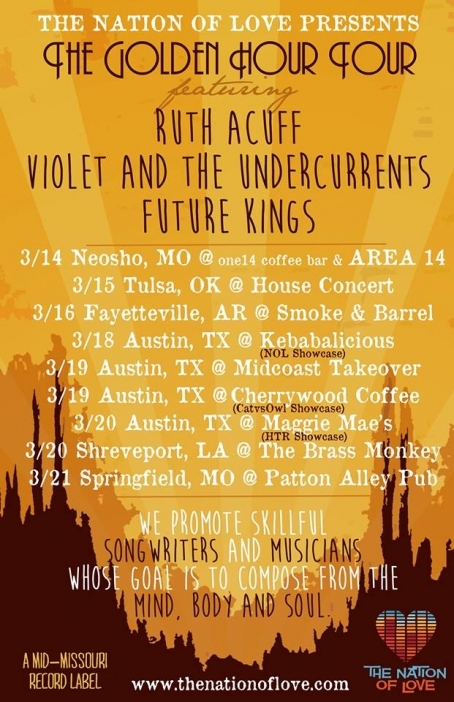 The Nation of Love continues to expand its reach by embarking on its first tour in March with Ruth Acuff, Violet & the Undercurrents, and Future Kings. They’ve also launched a crowdfunding campaign to raise money for travel and showcase expenses. The Golden Hour Tour, from March 14-21, will cover venues in Missouri, Oklahoma, Arkansas, Texas, and Louisiana, with several unofficial showcases at the big music fest in Austin (including a day party at MidCoast Takeover on March 19). This Saturday, January, 31, The Nation of Love will be showcasing four of its artists (Ruth Acuff, Zorya, Violet & the Undercurrents, and The Future Kings) at Coda. Doors at 8 pm. Facebook event page. You can also visit this page to help The Nation of Love reach its goal for The Golden Hour Tour; the campaign ends February 6. Listen to tunes from each of the artists at this link. The Kansas City music community has suffered an irreplaceable loss today with the passing of Abigail Henderson, who fought a long, courageous battle with cancer. With her husband Chris Meck, Abby co-founded Midwest Music Foundation when she was diagnosed in 2008, with the goal of providing health care assistance to musicians. Since then, MMF has given a number of grants to musicians with health emergencies. Apocalypse Meow, which began as a benefit for Abby, now benefits the musicians' emergency health care fund and will reach its sixth year in November. 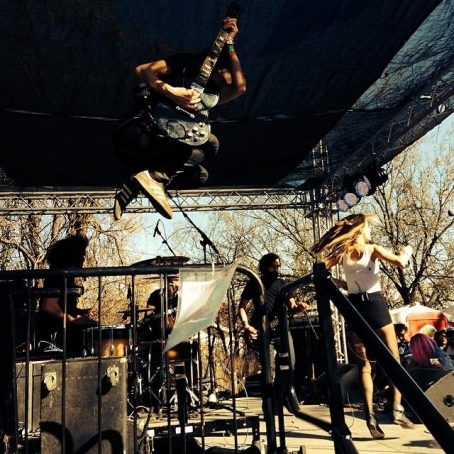 With the conviction that musical talent from the Midwest rivaled that of anywhere else in the nation, she also helped create MidCoast Takeover, a regional music showcase at SXSW that reached its fourth and most successful year this past spring. 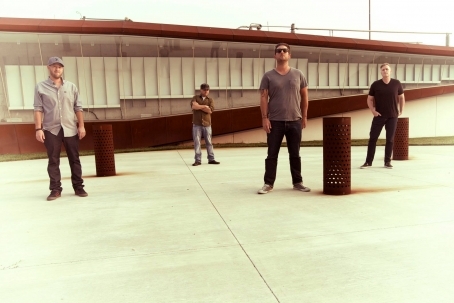 The Deli named MidCoast one of the best unofficial showcases of 2012, and approached MMF to head up a Kansas City chapter. Thus, The Deli Magazine—Kansas City was born and thrives with Abby's goals in mind: to promote local music, foster talent, and provide a sense of community and inclusion among those who have a hand in KC music. 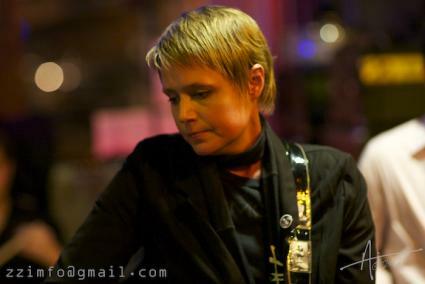 Abby was also frontwoman and songwriter of Tiny Horse, which began as a duo with Chris Meck and was eventually realized as five-piece band (link to video below). She was also in notable bands including Atlantic Fadeout, The Gaslights, and Trouble Junction. I had the distinct honor and pleasure of interviewing Abby for The Deli KC last fall in preparation for Apocalypse Meow 5. If you want to know more about this amazing woman and read her words (because mine simply cannot do them justice), please click this link. And as a fellow musician/MMF staffer/friend, I want to personally thank Abby for her steadfast spirit, support, inspiration, beautiful stories and songs, friendship, and the wonderful people she's helped bring together as a result of all those things. And I'm certain that I'm one of a multitude of individuals that share this sentiment. To commemorate Abby, please take a moment to find out more about MMF and its mission by clicking on the image below. Donations are always appreciated and will continue to benefit the musicians' emergency health care fund. Thank you, Abby, for the effect you've had and will continue to have on the music community here. Kansas City has undeniably become a brighter, more vibrant place with you in it. Michelle is editor of The Deli Magazine - Kansas City. Meow. 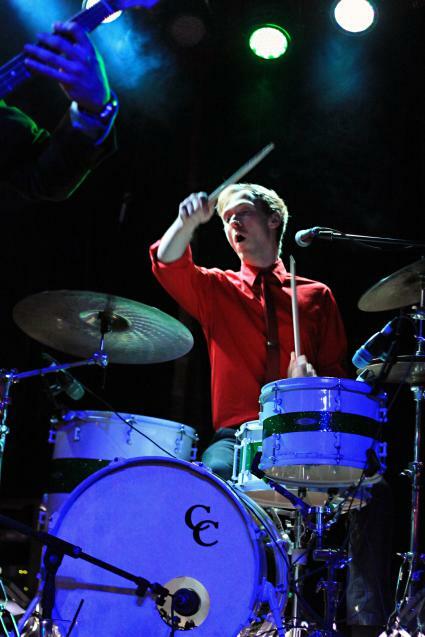 From promoting local music by presenting it on the radio or pounding on a kit on stage, Liam Sumnicht is a loud proponent of the Kansas City music scene. His band Not A Planet is getting its name known in the area with an album release in the next month, and is playing one of the MidCoast Takeover fundraisers this weekend. To find out more about Liam, catch the beat right here!